I was staging a house last year for a lovely family who had decided to move so they could be closer to their kids colleges. Unfortunately, as we were getting ready to list $1M+ home, I could already tell that despite our best efforts, this was going to be difficult. Reason being – horribly outdated master bathroom. They had taken down some walls, opened op the kitchen, redone the fireplaces, all lighting, adding new HVAC and completely remodeled the kitchen and the mudroom. Kitchen was fantastic. As you walk in you see this beautiful entry, high ceilings, gorgeous kitchen and then cross the master to this large pink marble coated bathroom, we are talking all surfaces, with rusty brass finishes everywhere. It would have cost around $15K to redo that master and there was such a difference between that and the rest of the house that unfortunately any buyer is walking off thinking must undertake this massive project. It is hard though to renovate when you are not planning to move any time soon, then you do things that make sense for your family. Sometimes life happens and there’s not much you can do. You will renovate for yourself first and foremost and you must realize you will never recoup 100% of your investment, but some are certainly worth the effort more than others. Let’s have a look which renovations will add more value to your house. 1. Always check out the market value of your house before deciding on what to renovate. If your house if worth $750,000 and other houses similar to yours top out at $800,000, then you should plan to spend no more than $50,000 on renovations. and even with you’ll just break even. 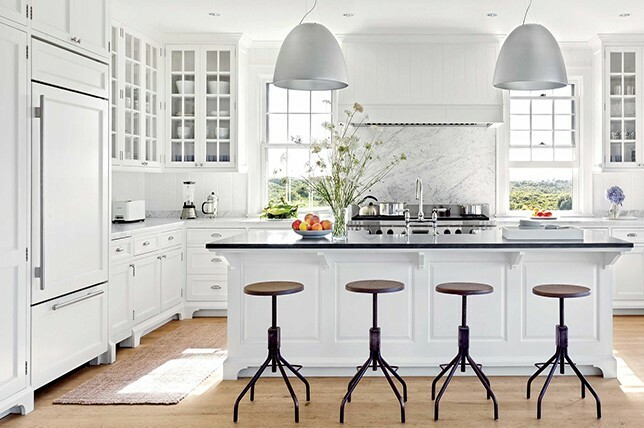 Elle Decor: most popular kitchens in 2019. 2. This you all know: kitchens and bathrooms renos have the best return on your investment. Market analysis comes handy here too. For example, around us in Fairfield County most houses houses under $1M will usually have quartz countertops, but in homes over $1M marble is more common. If your cabinets are in great condition, sometimes all you have to do is paint them and/or replace the fronts, updating the counters and backsplash is usually a good idea. Bathrooms will benefit from new fixtures and lighting. Spending around $20,000 on a remodel will get you 80-90% ROI, anymore than that and you will be getting back about 54%. Renovated master bathroom: here’s a bathroom HDS Design renovated. The tile was blue and white with some decorative pieces mixed in which made it look messy and dated. Wall tile was painted, as were the walls, moldings and vanity, new fixtures installed and fan installed. 3. Curb appeal – in my opinion the most overlooked upgrade to your house at any price point. Overgrown foundation plants that obscure the house, mature trees that haven’t been trimmed, and unkempt bushes all deduct from the value of the house. More than anything, nice curb appeal suggests that house as its grounds is well maintained. 4. Finish your basement – it will add more heated square footage and instantly add a teenage rec room, playroom or man cave. 5. Create more space by opening up some walls. Especially in older homes with more smaller rooms, it pays to take down a wall or two to create a better flow and more open space. You should definitely consult an interior designer or very knowledgeable contractor so you have a better idea of the look you are going for. WSJ had a great article on top 10 upgrades for luxury market here. Also keep in mind who would be your target buyer when you do sell. Is it a bachelor, a childless couple or a family and then plan accordingly.